Is Anyone Ever Ready When They Get the Call to Parenthood? 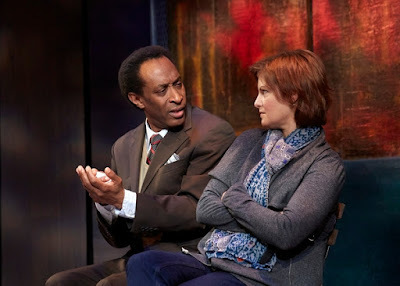 Questions of race and motive come into play as a white couple seeks to adopt an African-American girl in Tanya Barfield’s thought-provoking play, The Call, getting a run directed by Jenn Thompson at TheaterWorks. Annie (Mary Bacon) and Peter (Todd Gearhart) have ended years of trying to have a baby and numerous miscarriages with a decision to adopt. That decision prompts some intriguing questions about whether the white couple know what they are getting into. Annie’s African-American best friend Rebecca (Jasmin Walker) offers to help do the child’s hari, for example, but her new spouse, Drea (Maechi Aharanwa) has some harder questions like will the girls mother ever really understand what it feels like to be a black woman? And the questions don’t stop there. Why look to Africa to adopt? Aren’t there a lot of children in the US who need homes? And why does their neighbor, Alemu (Michael Rogers) keep insisting that the couple take syringes, soccer balls and used shoes with them when they go to his homeland to adopt? Annie and Peter have some hard questions for themselves when they finally get “the call” from the adoption agency saying a child is available for them to adopt. Are they willing to put aside their dreams of adopting a baby and take an older child – one whose health might not be perfect? Are they ready to make this commitment jut when Annie’s artistic career seems ready to take off? The drama plays out in Annie and Peter’s apartment and a dog park with a few props and sliding panels designed by Luke Hegel-Cantarella to make easy transitions between scenes. Thompson’s taut direction, with attention to detail, transforms the play into an emotional power house. There is a lot more going on here than just the question of adopting or adopting across cultures. Annie’s mental state is questionable. The fertility treatments and their failure have taken their toll and we wonder whether she is ready to be a mother to anyone at this point. Conversation and body language indicate that Peter questions just how solid their marriage is. There also is baggage from Peter’s days in Africa with Rebecca’s brother, David, who later died of pneumonia complications brought on by malaria. Why won’t Peter ever talk about David or answer questions for Rebecca? The couples sit around drinking wine, sharing gourmet food in their comfortable apartment while solving the world’s problems. The significance that Annie and Peter can’t even figure out how to solve their own issues, or comfortably relate to their African neighbor, is not lost. And despite their close friendship with Rebecca and Drea, just one word can suddenly spark race issues and tension takes center stage. Barfield’s script raises a lot of issues in a natural way while handling exposition extremely well so we don’t get bogged down in how all the characters met and came to know each other. Characters are multi-layered (Costume Designer Tracy Christensen dresses them) and are strongly portrayed, with Aharanwa getting laughs with Drea’s plain-spoken dialogue. It’s a strong ensemble and a brisk 90 minutes including intermission. Answer The Call through June 19 at TheaterWorks, 233 Pearl St., Hartford. Performances are Tuesdays, Wednesdays and Thursdays: 7:30 pm; Fridays and Saturdays: 8 pm; Saturday and Sunday Matinees at 2:30 pm. Tickets $15-$65; (860) 527-7838; www.theaterworkshartford.org. Lighting Design by Rob Denton, Sound Design by Toby Algya.